Rohini Pararajasingam, a Jaffna Tamil woman is unknown to many. She is soft spoken, and a person with highest qualities, is proud to have saved 35,000 volumes of valuable books during the conflict in the peninsula. She served as the Assistant Librarian, and climbed the ladders with colours and dedicated service, and promoted as the Chief Librarian at the prestigious University of Jaffna. 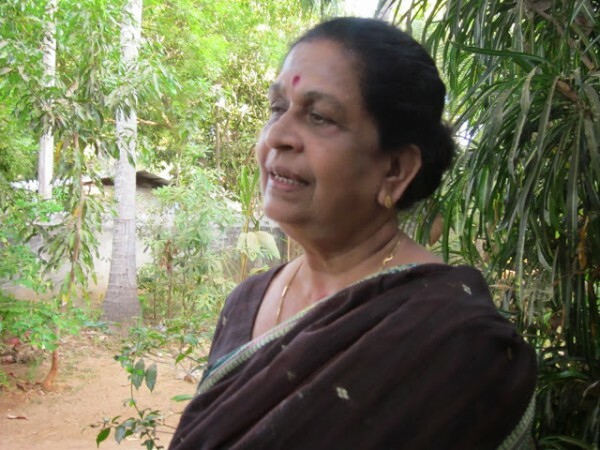 She served for 35 years, as Jaffna Peninsula has witnessed the worst years during the conflict. 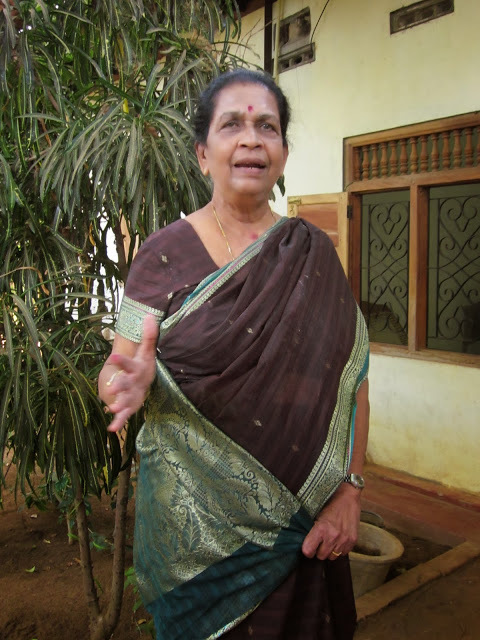 She was promoted as the Chief Librarian of the University of Jaffna in 1994, and retired in 2005. She welcomes me with a warm motherly kiss, and a bright smile. She holds my right hand gently and softly, as we both walk through an alley to her house in Urumpirai, outskirts of Jaffna town. Rohini Pararajasingam being an ardent reader, has passionately read Penguin books. She graduated from the University of Madras in India with a degree in Zoology, and has completed Diploma and Masters Degree at the same university in her passionate subject Library Science, and returned home to convert her passion for books into profession. She served at Cargills Book Store for a short period, before she was selected as an Assistant Librarian at the University of Jaffna. “I saw a newspaper advertisement calling for an assistant librarian, and I applied the day before the application date closed, and I was selected to serve”, recalls Rohini with a smile. In October 1987, hostilities between the Indian Peace Keeping Forces (IPKF), and Liberation Tigers of Tamil Eelam (LTTE) were intensified in Jaffna Peninsula, and the University of Jaffna too came under continuous attacks, and causing extensive damage to the equipments and documents. Many unforgettable violent incidents took place in Kokkuvil, and Thirunelvely during this period. Rohini Pararajasingam hails from Point Pedro, and was living in Thirunelvely, near the University of Jaffna during this time. She received a call from a fellow staff. The Chief Librarian was on sabbatical leave, and Rohini Pararajasingam was appointed as the Acting Chief Librarian at the time of violence in the peninsula. “I had to make an instant decision to move the books to a safer place. It was pitch dark, and pouring rain, something had to be done immediately to safeguard those books. Valuable books were being looted by the neighbours, and Indian soldiers were using the books as to serve as stools. I along with some staff members, and volunteer students, have carefully started to collect the rain soaked books from the University Library, smoothly covering the books with my costly silk sarees, and transported them in lorries to Chaavakachcheri to be stored in a school. Sri Lankan army which was confined to the barracks during that period too came out to help us finding the rain soaked books. I bore the transport cost, which was later reimbursed. I think that, when libraries are targeted, the idea is to destroy entire culture, and to deny learning. There is a famous Tamil saying, that to look at one’s own reading is to know one’s mind and culture. It extremely hurts us. We love our books, and we lost most precious ones. There is no possibility of replacement. People of Jaffna love knowledge and learning. It is part of our culture. What was lost will remain lost to the people of Jaffna. We can add new books, but nothing can replace the old books, what was lost will remain lost forever”, painfully recalls Rohini Pararajasingam with tears. Although her immediate action to move the remaining books to a safer place was bitterly criticized instantly, her brave act was commended with a certificate of appreciation by the Jaffna University authorities later. “I did what was needed to safeguard the rest of the books from being vandalized at that time. I neither stopped to think nor asked my husband to decide for me. I went ahead, decided, and moved the books to a safer place. I was 44 years, when I had to make a sole decision to safeguard priceless volumes of books”, proudly adds Rohini Pararajasingam. She also complained to the High Commission of India, in Colombo, about the way the Indian soldiers were disrespectfully handling the books at the library. “Those books were our lives; our source of knowledge. Foreign army which was sent to maintain peace, simply did not know our culture.We could not safe the books in the statistical section, but only managed to salvage the books from the reference section”, shares Rohini Pararajasingam as tears roll down her cheeks. Every time she mentions the words “books and library” her eyes uncontrollably fill with tears, and she cries. She revisits her painful past journey with dreadful memories. “I couldn’t save all the books which estimated 64,000 at the time of violence. I only managed to save volumes of 35,000 books. The rest is all gone. We will never be able to replace”, sorrowfully recalls Rohini, while wiping her tears. Rohini Pararajasingm at her seventy, still mourns the loss of treasured volumes of valuable books. She has also lost numerous personal belongings, as the conflict intensified in the peninsula. She moved to many places, multiple times with her husband, and two young daughters. “I had to buy everything from the kitchen knife to a dining table. Our calm and simple lifestyles were suddenly altered more than once. Only the spate of violence that survived as our only belonging”, tearfully recalls Rohini Pararajasingam in Jaffna. She acknowledges with gratitude S. Murugavel, the Former Chief Librarian of University of Peradeniya, and University of Jaffna as her guru in Library Science. She learnt the art of Library Science under his attentive guidance. Rohini Pararajasingam leads a retired life in Jaffna, but haunting memories don’t allow her to forget the past.